GPT TEAM FRP TOOL is a Windows application which allows you to Unlock your Samsung Device FRP by ADB FRP method, It Also allows you to make a full factory reset, This tool created by GPT Team for all GPT group Members. It allows you to Read the Samsung device info, Clean the virus in ADB Mode, Google Login, and much more option included, ADB FRP Tool. Note: This is beta version download it and check this tool and tell us your views about this tool, we make better in next update. 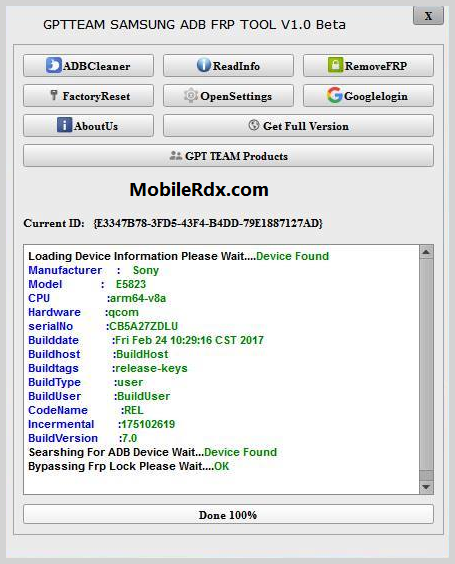 Credits: GPT Team Samsung ADB FRP Tool v1.0 is created and distributed by GPT Team. So, full credits go to GPT Team for sharing the tool for free.